I was stitching out a panto on a customer's quilt when the right handle fell off the machine. It was a sloppy weld, there's white paint inside the weld. Wouldn't you know it....I'm leaving in 1.5 days and have 4 tops to quilt before I leave. ..and the machine breaks! How do we get this problem fixed? Maybe you can loosen the two screws and take off the rest of the mount and take the two pieces to a local welder tomorrow have have them welded together. The paint on the handle will get messed up but you will be back in business until APQS gets you a replacement. Have you tried quilting with your left hand on the left handle and your right on the back of the machine. That’s how I used to do the Circle Lord templates on the Millie. I found it quite uncomfortable trying to hold both handles on the rear. 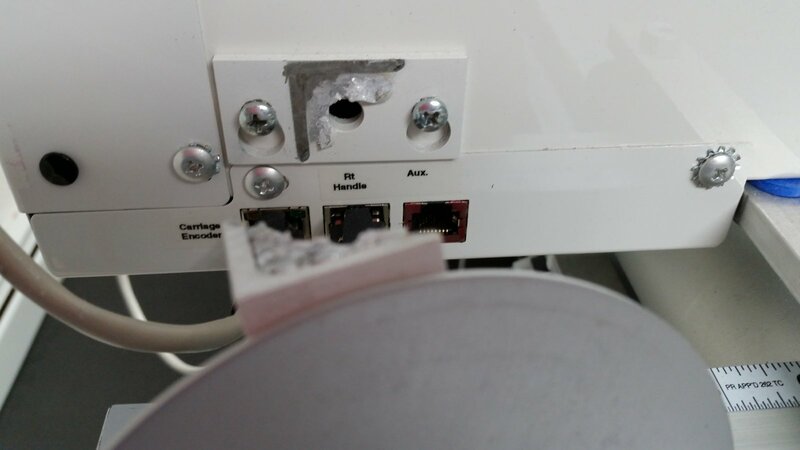 You could probably use masking tape to hold the broken handle to the side of the machine so you can access the start/stop switch. How far are you from Matt Sparrow maybe he would take a handle of one of his machines to get you going. Please make sure you send this picture to APQS service, they need to know about items like this!!!! Matt Sparrow would be a good contact to call, he's a top notch guy who is always there to help APQS customers.